I’m so excited to be back and sharing my version of the The Home Depot Do-It-Herself Workshop Hanging Gutter Planter. This project was so much fun! If you missed the BIG announcement last week, myself and three other bloggers were picked by our host Sandra at The Rustic Life to participate in The Home Depot Virtual DIY Workshops. Don’t forget to check out their versions of the Hanging Gutter Planter too! 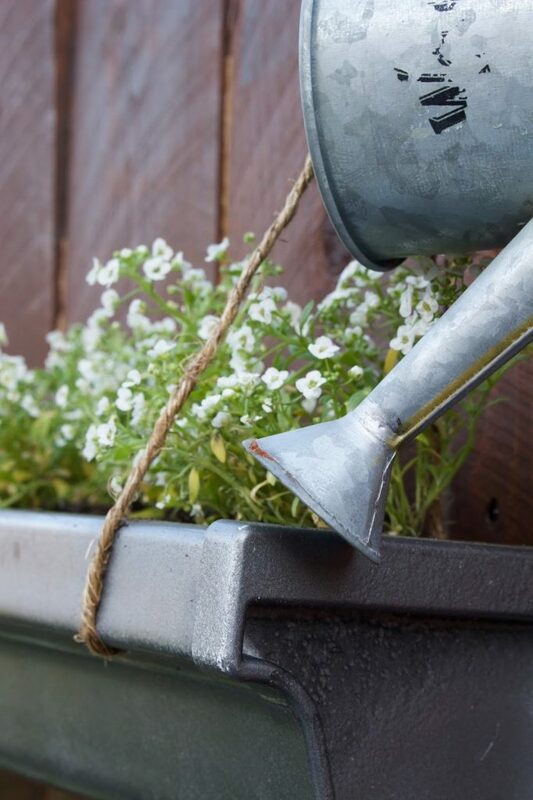 Want to learn how to make your own Hanging Gutter Planter? Mark your calendar, bring your best friends and attend the Do-It-Herself Workshop at your local Home Depot store. The Home Depot provides FREE Workshops at all of their locations for do-it-yourselfers of all ages and experience levels. There are three types of workshops: Do-It-Yourself (DIY), Do-It-Herself (DIH) and Kids. Workshops are where customers can learn how to build decor projects, how to make easy home repairs and how to operate tools through demonstrations and step-by-step instructions. I just recently took a Do-It-Yourself Workshop on installing a tile backsplash and couldn’t believe everything I learned. Visit http://workshops.homedepot.com to learn more. This little project was so fun and the best part is it is completely customizable to your space. To customize my planters, I used the spray paint for a galvanized look. And I must say this might be my new favorite spray paint, it achieves that metal look perfectly. I also used natural sisal rope for a more rustic look. Once my gutters were hung, planting my favorite flowers was a breeze. I’m sure you all know I’m not a big fan of color and like to keep things neutral at our house, so all white was perfect. 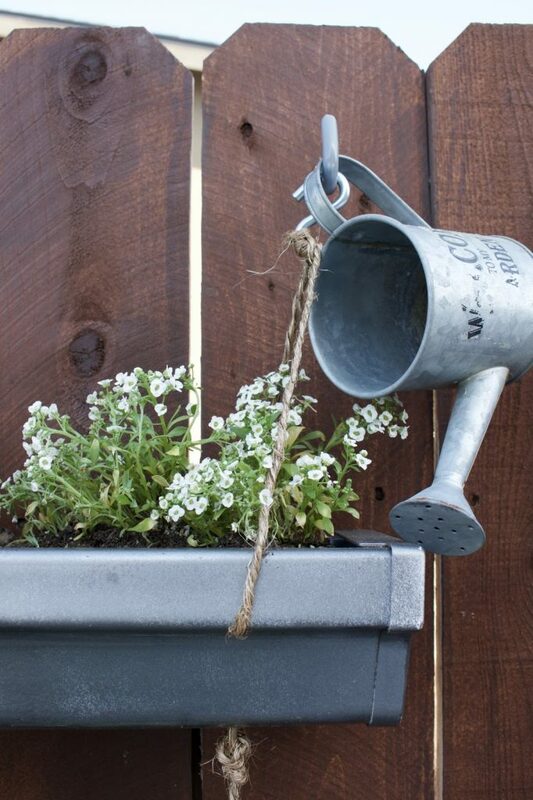 The hooks are great for hanging my little watering can that matches my “galvanized” gutters perfectly! Don’t forget to drill extra holes in the bottom of each gutter for drainage. I love this planter so much, I want to make more and hang them in multiple rows along our fence. It’s a simple touch that adds a lot of character to an outdoor space! Don’t forget to check out your local Home Depot for more workshops and register for the upcoming Do-It-Herself Workshop! Wanna see even more versions of this fun Hanging Gutter Planter? I acknowledge that The Home Depot is partnering with me to participate in this program. As a part of the program, I am receiving compensation in the form of products and services, for the purpose of promoting The Home Depot. All opinions above are my own and my experience with the product and brand. 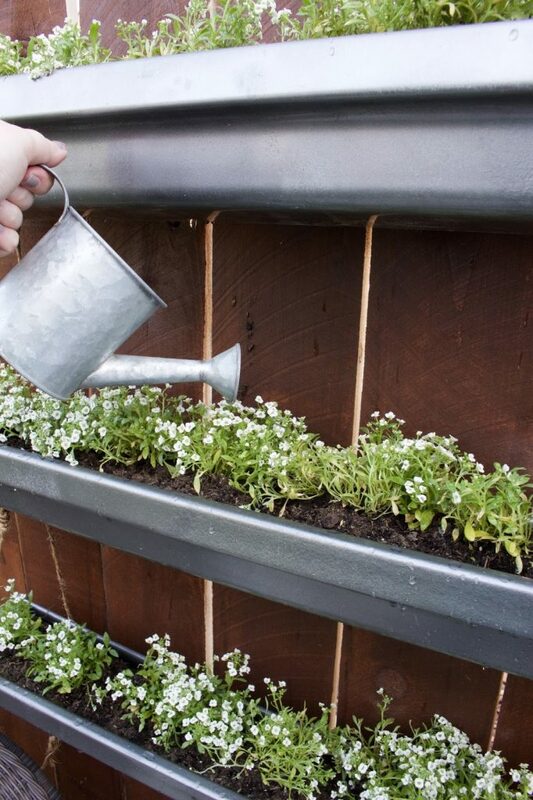 The hanging gutter planter looks great hanging on your fence. It's been so much fun to see how everyone did their own spin on this project! Thank you so much Gail! This has been such a fun virtual party! I love the sort of galvanized look the hammered spray paint created – the watering can adds a fabulous touch! Thank you! This paint is def my new fav! I love your version Allison! This is really a amazing idea for gardening and i love this tips. I will try them for my garden. Thanks for sharing.